After a fun evening at a club, gig, or festival, we return home to the peaceful stillness of our homes, and it begins: the all too familiar ringing in our ears. Tinnitus – an unwelcome side effect of an enjoyable, albeit loud, night on the town. For most of us, it’s temporary – after a good night’s sleep we awake to find the ringing has subsided, and we put it to the back of our minds, until we experience it again. It’s easy to shrug it off. It’s not that bad, we say. It’ll pass. But all it takes is one loud night for that to change. Tinnitus is a serious condition where the ringing in one’s ears does not subside and becomes permanent. It’s a common misconception that only regular exposure to loud noise that can cause tinnitus – in fact, tinnitus can occur after just one incident. Worst of all, there is currently no known cure. Surely it can’t be that loud? The average club or festival stage ranges from 100-120 decibels. 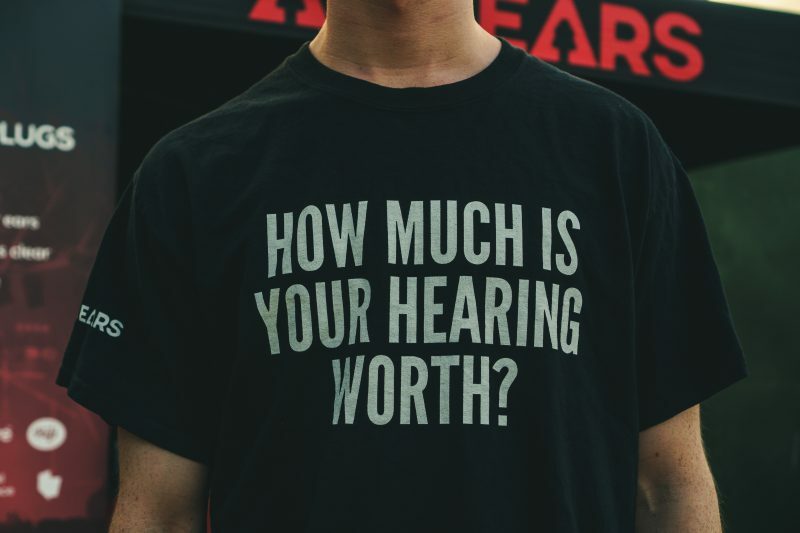 Considering that the safe exposure time at this level is only 15 minutes, you’re often leaving yourself at high risk of permanent damage to your hearing. Some gigs have far exceeded this average. The likes of Foo Fighters, Kiss, Leftfield, Gallows and Motorhead have all performed shows recorded at upwards of 130db. I don’t need to protect my ears from tinnitus, I’ll be fine! We at See Tickets, along with the All Ears Campaign, believe it’s time we stopped shrugging it off and started taking better care of our ears. There are a ton of misconceptions about tinnitus out there. This is simply not true! Hearing damage and tinnitus can happen after a single night of loud music. It’s never too late to start protecting your ears. Hearing damage and tinnitus can always get worse, so start protecting them now and avoid further damage. People often think of the foam earplugs which muffle sound. Did you know there are plugs out there made specifically for consuming loud music? High-fidelity earplugs attenuate the frequencies equally, ensuring the music sounds clear and conversations can still be heard. How can I look after my hearing, and still enjoy the show or festival? You don’t have to sacrifice a good time and your enjoyment of the music to still experience a live show. The best method of preventing hearing damage is wearing earplugs, and high-fidelity earplugs are the ideal option. They are a reusable product containing an acoustic filter that allows the music to sound crystal clear whilst also protecting your ears. The All Ears campaign will be at a range of UK festivals this summer, offering advice on protecting your hearing and high-fidelity earplugs, including MADE, Elrow Town and Creamfields. Whether you believe it’s too late to save your ears from further damage, or you sadly already suffer from tinnitus, there are ways you can help yourself. If you’re preventing permanent damage, take breaks from loud music, stand back from the speakers, and know your safe listening times. There are things you can do to help manage your tinnitus. We know it can take a toll on your mental health, so make sure you find ways to make things easier. Meditation and relaxation techniques, chatting about your anxieties, or using sound to distract you from tinnitus are just some of the ways to manage the condition. Tinnitus affects so many of us – including the likes of Chris Martin (Coldplay), Eric Clapton, Grimes and Will.I.Am. Make sure you take care of your hearing. Matt, Oli and John founded the All Ears Campaign. Together, with international ear plug experts Alpine Hearing Protection, the team are dedicated to making a positive impact on the music community. Both Matt and Oli suffer from tinnitus, stemming from listening to live music without wearing ear plugs. It’s a condition they would not wish upon anyone, All Ears was created to prevent anyone else from getting it. You can find out more about All Ears and the work they do here.